I am an energy worker and healer, and in all the work I’ve done, I’ve never had tingles DEEP in my core... and so immediate... WOW what a journey! I’m writing a dissertation on how FANTASTIC this was! 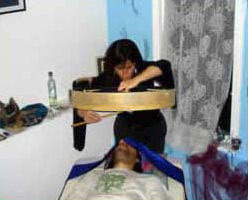 Sound Healing Therapy is based upon the recognition that everything is made up of vibration. Receiving or creating intentional, healing sound vibrations is proving to be one of the most direct, most relevant healing modalities available today. Sound healing sessions lead you on a sound journey to your own heart-center-soul. When you first arrive at Sound Moves Healing Arts, we will check in with what type of healing or realignment you would like to receive. I will also ask you to set an intention. The asking of what you're desiring from the sound journey is key, as we tune into your particular needs that day. In your intention you might ask for healing, alignment, clarity around a troubling issue...whatever is most present for you during this time that is carved out just for you. I will then ask you what particular spiritual guides/avatars/angels you resonate with, and we will call them in to assist us in your journey. As you move into a receptive, relaxed space, I tune into your guides and soft energy bodies, and they both begin to guide me to the instruments, vocal melodies, percussive rifts, and key crystal bowls that will most benefit you. The sound bath is always unique and different because your soul sound is your sound fingerprint! I act as a channel for your guidance to come to you during the sound session in order to inform/direct/heal/ realign you, in whatever way you’ve asked. As new spaces of be-long-ing are created through the sound healing waves, the invitation into relaxing and receiving your beautiful sounds, callings, and nuances becomes irresistible. You will arise feeling relaxed, restored and RE-SET! The zero-point field is the sub-atomic structure of all molecules in the universe; it provides the universal communication network between the cells in your body. When you are able to drop deeply into your original zero-point field, your soul’s communication becomes clearer, and your frequencies are re-energized. A sound healing bath or, journey, re-immerses you in your zero-point field-like hitting the re-set button... it essentially re-sets the spin of each cell and chakra reminding and re-connecting you with your deep, glistening, lovable, creative Self. This aspect of Self very often will be able to send you clearer messages after you've allowed your energy to be "re-set". The sessions generally last 75-90 minutes. An option of recording the sound healing journey will be available. I do take some insurances, and we can work out a payment plan, if finances are tight for you at this time. ©2008 - 2019 MeredithMcFadden.com. All Rights Reserved.